Today, I'd like to highlight one more great costum part, from iLegos. 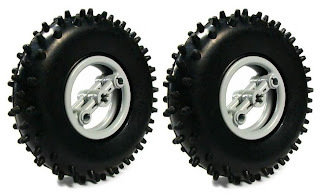 Spiked Tires, are just great for your TECHNIC off-road creations or fighting MINDSTORMS robots, where good traction is a must. 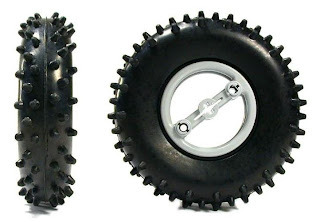 You cand find these Spiked Tires at iLegos store (eBay). See them here. - They are sold in sets of two, each mounted on 2 original LEGO Big Pulleys (light bluish gray) with a rubber ring each. - 76 mm (3 inches, 10 studs) external diameter. - 19 mm (3/4", 3 studs). - Great look and matte black unfinished rubber. - Unmatched 'All Terrain' performance and great traction. What I mean is that, even for 3rd-party pieces, they don't appear much to be made by LEGO. Maybe I'm spoiled by the HiTechnic sensors and the mini-motors by the same people who make the wheels, which externally use LEGO parts.